How do I start Organicising? Starting and finishing seem to be the hardest part for some people, but for me, it’s actually the stuff in-between that’s most challenging. I personally love the adventure of starting something new with the promise of a great result. And I find the key to getting started is in your plan… yep, that 4-letter word: plan. With a project like detoxing your home a plain is essential, no matter how small you want to start. This is why I wrote the book Organicise, to make a potentially overwhelming task, very manageable. So, of course my first recommendation is to buy the book! Organicise works as a 7-step plan that you can do either at your own pace or in the framed 7 days! Let’s take a look at a simple 3-step plan which will explain some essentials to do the detox at your place. I would probably go with cleaning products as an essential first step as you will use these throughout your home. Microfibre cloths are amazing! They will clean, dust and polish without using use of any cleaning chemicals, and you don’t need anything except water. How cost effective is that! For that fresh smell you can add an essential oil or some drops of fresh lemon in the rinse water (no acid for marble surfaces). Some people opt for vinegar but, let’s be honest, it doesn’t really bring a smile to the face! Microfibre cloths are made of tiny wedge shaped fibres, up to 100 times finer than a human hair. These tiny fibres grab and hold dust and dirt. They are long lasting and re-usable, can hold up to 7 times their own weight and they dry very quickly. Microfibre can reach into the tiniest crevices and any dirt and grime is not released until they are washed in hot water. And you can purchase them at the supermarket! In the kitchen for cleaning all surfaces, including the stovetop. The tiny fibres pick up more dirt and food residue than most cloths. They absorb fat, grease and oil, and these are not released until the cloth is washed in hot water. In the bathroom, microfibre can clean it all – use a separate one for the loo. Floors, whether your a ‘hands and knees’ kind of person or the mop, microfibre makes it easy, easy, easy. No more wet floors, the mops squeeze to a great damp. Shiny surfaces like chrome taps, etc, can all be polished with microfibre alone. Dirt disappears, and you get those shiny surfaces with little effort. Windows can be cleaned with just microfibre cloths and water. Use one cloth to wash, and another to dry. No dirt, no streaks. Microfibre cloths are not hard enough to scratch surfaces unless they have retained grit from previous use. Sensitive surfaces such as LCD screens can be damaged by using a microfibre cloth which has picked up dirt or other abrasive particles during use. Use a fresh cloth for these surfaces or wash the cloth in between usage. 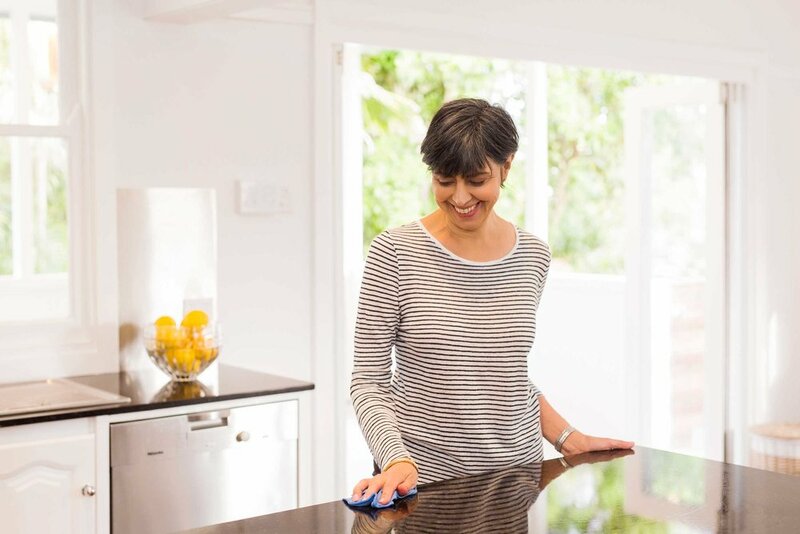 Microfibre cloths should be used damp for cleaning and dry for dusting. They work best for cleaning if soaked for a few minutes in warm but not hot water. If the cleaning needs a bit extra effort add a little non-toxic cleaner. Its really important to clean your cloths after use by washing in warm to hot water with a little dish detergent. They can be washed in the washing machine but must be kept away from fabric softener. Fabric softener clogs the fibres and will ruin the cloth. Ensure your washing products are non-toxic (as in step two). Not all cloths are equal in the world of microfibre. Any microfibre cloth is an improvement but experiment on a few different brands till you find your best fit. And I guarantee you will love the results. Join a culture who cares about what you invite into your body and home. Organicise the newsletter. A catalyst for a better life.